An undisputed tenet is that change is undeniably a good thing. Whether it is the passage of time healing an old wound, or packing your bags and heading off on an adventure, there is rarely (if ever) a moment where changing or passing time doesn't bring new and exciting encounters. However, when it comes to property, time brings with it the eventual decline of a building that, more often than not, results in deterioration and the decline of both style and structure. Even when properties are maintained well they eventually reach the point at which they need renovation or refurbishment. Time-worn dwellings are often full of character, but still require consistent updates to suit changes in building standards, fashion, and to lengthen the lifespan of a property. Here at homify we love seeing an old dwelling provided a spectacular rebirth and renewal, and today’s project is no exception. 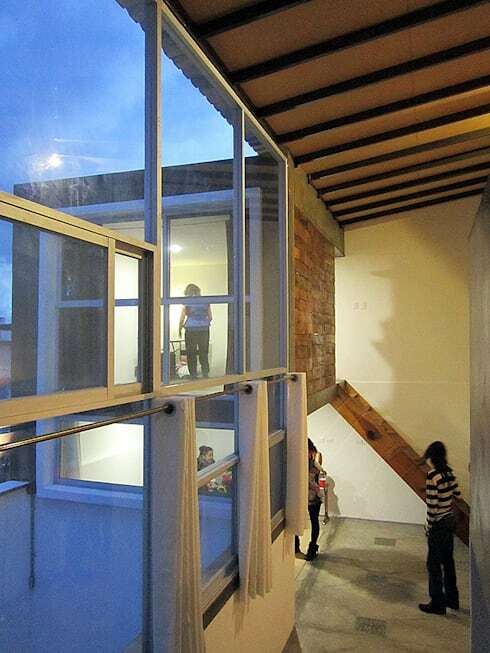 Travelling to Mexico, this neglected dwelling has received a fabulous makeover and complete transformation. The loft home in question has been redesigned and updated by the team at NonWarp, and is almost unrecognisable in its newly formed state. If you’d like to see an amazing exterior update and refurbishment, along with the incredible before and after photos, then read on to learn more! First off we are going to take a peek at the final product. This loft is impressively large and stylish, boasting a range of gorgeous finishes and inviting touches. 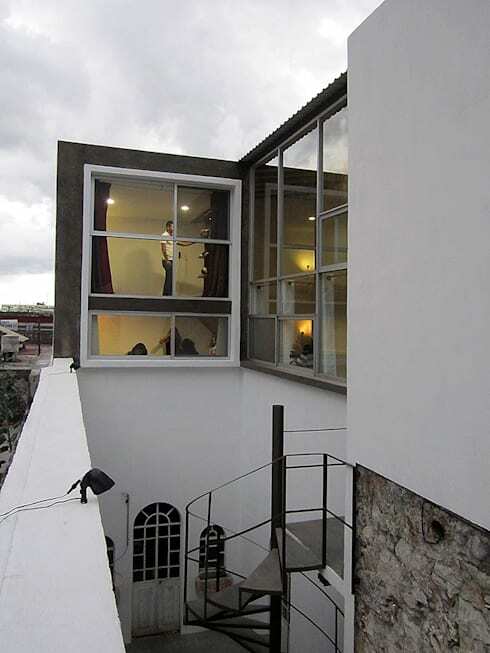 This 'Loft H-11' as it is known is so much more than simply a place to live; it is a conceptual design with a fabulous juxtaposition of the old with the new. 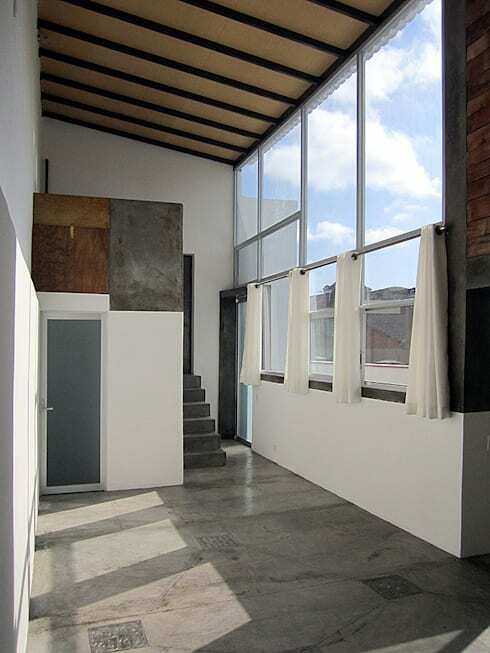 The loft overlooks the city and is provided panoramic views thanks to the abundant glazing, which additionally offer a huge volume of natural illumination. The external fascia of the dwelling is neutral in its appearance and colour scheme, with a simplistic yet highly effective ambience. As unbelievable as it is, this is what the property looked like before the team at NonWarp started their challenging journey towards updating this home. 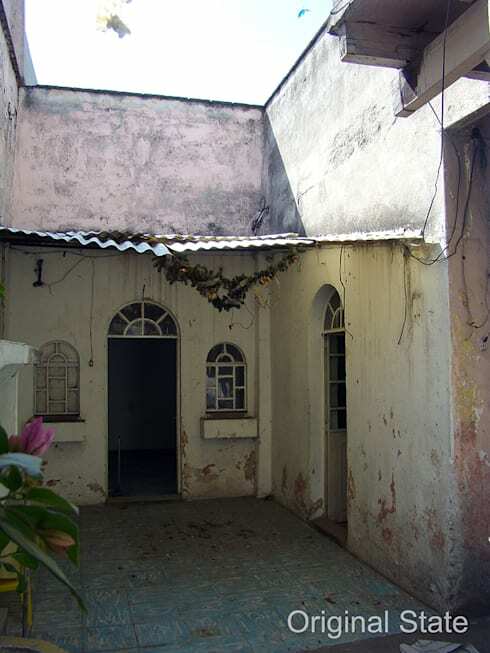 Not only old, this residence is also dilapidated and outdated. As we travel back in time we see the original structure and its neglected appearance. The home is well and truly run down, and in desperate need of an facelift. The dwelling is not only in dire need of restoration, but it also requires someone with a keen eye to refurbish its many architectural elements and bring it back into the 21st century. As we move backward a little we are given a glimpse of the entirety of the space, which helps to give an understanding to the overall design in conjunction with the above image. Here we again see the white colour scheme and its gorgeously neutral appearance. Just below the large glazed upper level we are able to see the original windows with their arched form. Moving inside the lost we see the chic industrial vibes that emanate from the interior spaces of this intriguing home. 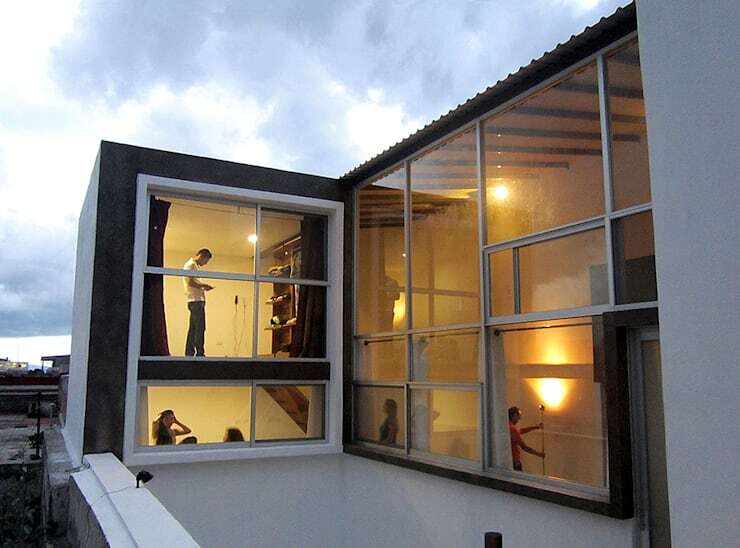 The loft is now a functional and versatile residence, a far cry from its initial condition and state. The architects have worked seamlessly with the double height spaces, and installed plenty of glazing to ensure the new rooms are light, bright and airy. Raw materials help bring a sense of history and earthiness to the dwelling, with an exposed brick wall adding an element of rough edginess. The interplay between the different levels within the room are gorgeously integrated with timber stairs, again adding to the overall raw elegance of the space. As we switch back once again to one of the original images of the dwelling pre-renovation, the sight is truly quite a shock. This unloved home has been given a thorough update and refresh, which has resulted in an almost unrecognisable outcome. 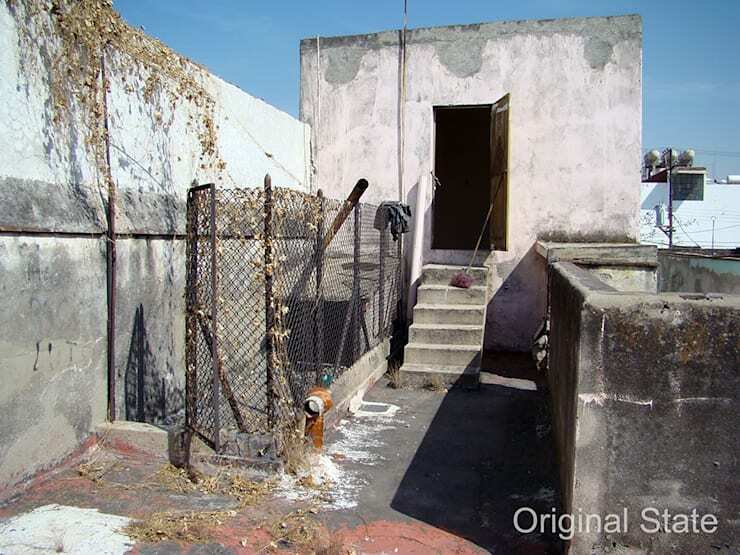 In this image the home features an old fence that is rusted and falling down, the walls have been blackened by a mould that grows on the exterior of the concrete, while the floor is stained and weather damaged. The area is now a wonderful terrace that provides an area for socialisation with friends, guests and family. Once completed the area is actually quite spacious, and would be an ideal area to host an outdoor afternoon tea, or festive evening get-together under the stars. The last image shows us a truly wonderful demonstration of the hard work and persistence of the architects and designers. They have created a home that evokes industrial elements, while still paying homage to the original structure and its natural materials. The room is perpetually bright thanks to the abundant glazing, but offers privacy for its occupants with bright white curtains that sit half way between the window panes. The updated dwelling is a stunning testament to ingenuity and originality, providing its occupants with a renovated residence of style, sophistication and age-defiance.